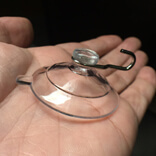 Medium suction cups with hooks. 38mm diameter, Thicker. 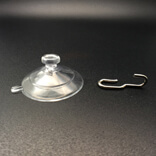 A suction cup is an object which mainly acts like a sucker. It helps to use the opposite pressure of air or water to the surface which helps to create the vacuum. It is made up of elastic and a material which is very flexible with a curved surface. When the middle of the cup with curved surface pressed with a hand against the surface, there will be a less air occurs. During this time of the experiment, it will cause the low pressure. For example, you can check out the function of octopus or sucker fish which will resemble the process of the suction cup. If the suction cup removes from the surface, then it will be resume to its original position. It is the product 38 MH A which is mainly playing the major roles. 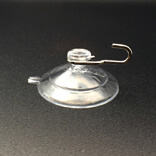 This suction cup can support the transparent glasses, stainless steel, refrigerators, tables, paint walls, wood products, wall posters and much more. 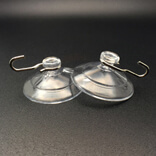 The KingFar industry also makes suction cup product for the model 38 MH A. There you see the products of the suction cup for the public use. 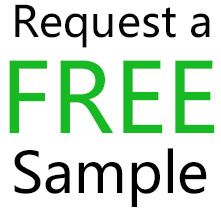 It is one of the best manufacturers industries. It can sustain mainly on the smooth surface like walls. It has the strong absorption capability supports up to 5kg which is unusual from the other suction cup. It can also sustain on wall temperature up to the 80 degree which is not very normal. The product 38 MH A is one of the best suction cups for industrial purpose. It has the strong capacity to uphold for a long time. And also it sustains up to -20 degrees of cold temperature. It is said to be the environment-friendly.